Teachers Recruitment Board Recruited Post graduate teachers in Various subjects through Conducting PGTRB Exams. For Chemistry subject the candidates must have the post graduate degree in Chemistry with B.Ed is the eligibility, criteria for writing this Exam . The questions are very depth. The candidate must know each and every part of the chemistry topics. In particularly they must know the solving method of equations. There is no negative marks for wrong answers . Hard work and well preplanned preparations can help the candidates to achieve their goal. 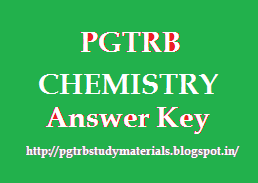 Our website helps to reach your destination by giving year wise PGTRB Chemistry Exam question papers with solved Answer Keys.